As much as we try to avoid it, there are time when we have to take our laptops home from work, and bring it in the next day. For some professionals such as designers and editors, a laptop is required where ever you go. The big question therefore for cycling commuters is – what’s the best way of carry a laptop on your commute, minimising any damage to the device? First things first. How big is your laptop? Depending on the size and weight of the professional’s laptop, some are easier and more recommend to carry over others. Typically you’ll find three main sizes of laptops- 11-13″,14-15.6″ and larger 17″ screens. Of course, the larger the screen typically the heavier the laptop is. 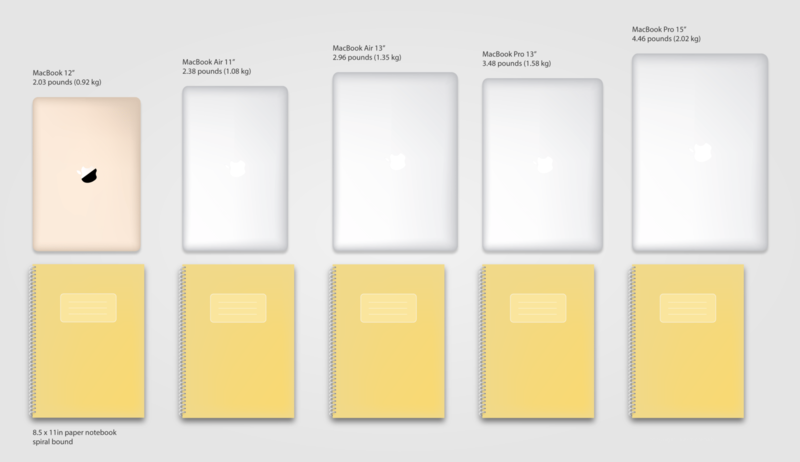 Here is an indication of the size and typical weights of the most common Macbooks today. Newer models that have come out may be lighters than indicated. In general, Windows ultrabooks and high end laptops follow similar specifications to Apple, with some manufacturers building laptops that are even thinner than the Macbook Air from Apple. It should be noted that budget Windows laptops can be significantly heavier and bulkier than the high end models. For 12 inch and 13 inch laptops, any bag would theoretically do the job of carrying laptop on your commute. From 15 inch to 17 inch onwards, you are looking at buying a slightly larger bag that covers its full dimensions. Look for manufacturers that specify what size laptops it is able to carry. We have some slight reservations for 17″ laptops because of the larger screen, keyboard, and the heavier build. If it can be avoided, generally we would recommend not to commute with such a large laptop due the weight it may put on your back. Next. What’s best for laptop carry – backpacks or panniers? The three key considerations for deciding the type of bag to carry you laptop on your commute is comfort, waterproofing and shock absorption. In terms of shock absorption, backpacks are generally better than using panniers. Panniers tend to create more vibration from the road, which often leads to the laptop vibrating while riding. The laptop is also subject to large jolts of force when hitting a pothole in the road for example. On the other hand, carrying your laptop in a backpack eliminates most of the vibration. Your back creates a stable surface for the laptop to sit against and the vibration from the road is mostly absorbed by the body before it reaches the bag. If you must use panniers, then extra padding through a laptop sleeve is advisable. Although backpacks are better for shock absorption, the weight and shocks will come on your body. Using panniers completely eliminates any weight or strain on your back. If your laptop is 17 inches, then your back will be thankful to you for using panniers. However, backpacks are still relatively comfortable if you carry light laptops such as Macbook Airs or Ultrabooks. If you do carry laptops on your backpack, pay attention of the position of the laptop inside your bag. Generally it is best to load the laptop close to your back, separated by shock absorbing padding. It is best to look for backpacks with added padding towards the back, allowing for a solid area for the laptop to sit against. The more padding there is towards the back of the backpack, the more vibration is distributed while the padding helps distribute any vibration before it reaches the laptop. Other pieces soft padding such as a layer of fabric or clothing around the laptop can also allow compression and keep the laptop more securely loaded in your backpack. As we know, water and electronics are not a happy match. Water damage to a computer affects the internal features, such as CPU, cooling Fan, Memory and so forth. Water seeping into the internals of a laptop can cause corrosion and numerous other types of damage to its internals. For those that often commute with laptops, a complete waterproof solution is a must. One idea is to put your laptop in a dedicated waterproof laptop sleeve. From our research this was not very easy to find and where manufacturers have claimed full waterproofing, it is not backed up by IPX certifications. The more secure solution is to invest in a seam welded waterproof roll top backpack or pannier. This fully ensures your laptop is dry, under any conditions. Although some backpacks come with “rain covers” – please be aware that these are not waterproof at all. It is only splash proof and under a heavy deluge water will seep in, as the rain can fall from any angle and through little zipper holes and stitches. Therefore, if you are a frequent commuter with a laptop – go for a backpack or pannier with at least an IPX5 waterproofing certification. If you don’t know what IPX rating are, see our article. Typically most zipped cycling backpacks will include a compartment for your laptop. A dedicated laptop compartment provides crucial padding against shocks and stops your laptop rattling around inside your bag. However from our research of the market, it is much less common for seam welded waterproof bags to have a dedicated laptop compartment. This is because any stitching to create a laptop compartment will create little gaps for water to seep in. Some companies make laptop compartment inside panniers, but these are expensive add-on to an already dear bag. We feel that a waterproof roll top cycling backpack must have a laptop compartment. That is why we have designed our waterproof backpacks to have a laptop compartment with generous padding, which can also be easily removed by velcro. If you are particularly precious about your laptop, then you can consider wrapping your laptop in a padded sleeve and then placing it inside the laptop compartment of a bag. This will offer the ultimate protection from impact, vibration and jolts from the road. Finally, turn off your laptop! Before any traveling or commuting it is recommended you completely shut down your Laptop before being stored away. The reason being is that the biggest risk of damage can come from the hard disc, due to impacts or vibrations when riding. When the laptop is hibernated or sleeping, it is possible that the laptop can be woken up, which increases the risk of cause damage to the hard disc during vibration or impact. Although we try to avoid it, in this day and age the reality is that many busy professionals will have to carry laptops on their cycle commutes. If you are carry light laptops, tablets and ultrabooks up to 13″, then the ideal solution is a seam welded waterproof backpack. If you carry larger 15.6″ and 17″ laptops or you do not want any weight on your back at all, then a seam welded waterproof pannier is the answer. For backpacks, look for a dedicated laptop compartment with ample protection and padding both for comfort and to stop the laptop from moving around within the backpack. Finally for overall peace of mind, wrap your laptop in a well padded sleeve before placing them in the backpack. Sign up to receive the ebook and receive weekly news and guides on all things cycle commuting!